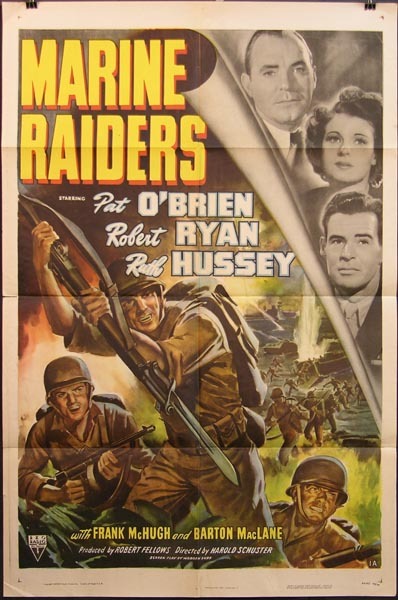 Marine Raiders is a black and white US movie from 1944. I’ve got it with a bunch of other “forgotten” war movies. Unfortunately, after having seen it, I’m pretty sure I know why it was forgotten. It wasn’t dreadful but it was certainly not very good. Fortunately it’s a very short movie (77 minutes). The two friends Major Steve Lockhart (Pat O’Brien) and Captain Dan Craig (Robert Ryan) are fighting together at Guadalcanal. Dan shows a lot of bravery when he goes on a “let’s-kill-as-many-of-those-beastly-Japs-as-we-can-rampage” after having seen the cruelty inflicted on one of his buddies. From Guadalcanal the two men are sent to Australia where Dan meets Lt. Ellen Foster (Ruth Hussey) and falls in love with her. During their date there’s a Japanese air raid and Dan is injured. Ellen is sent away for two days and while she’s gone, Dan is sent back home to San Diego where he and Steve will train new recruits. Before being sent to an island in the South Pacific, they briefly return to Australia. Dan and Ruth get married before Dan’s sent into battle. The last 15 minutes of the film show intense fighting. That’s the whole story. A romance bracketed by two major battles. The Japanese are depicted as cruel and vicious, but luckily the Marines win every battle. And there is some tired chow-related humour. Marine Raiders is still interesting as it’s very similar to the outstanding TV Mini series The Pacific. One could call Marine Raiders an uninspired precursor. So, for those interested in film history, it’s still worth watching. Just keep in mind, it’s not only a forgotten movie, but a forgotten B-movie. This entry was posted in Movie, Reviews, Trailer, War Movie, WWII and tagged Marine Raiders, Movie, Pacific theater, Pat O'Brien, Review, Robert Ryan, Ruth Hussey, War Movie, WWII. Okay, so you went from Hannah Arendt to Marine Raiders. That is one humongous swing! Could two movies be more different? It’s weird that just yesterday I was looking at DVDs that had up to 50 WWII movies on them. I’ll bet this was one of them. I will get around to it someday, if I live long enough. The two leads are not bad. Ryan enlisted in the Marines soon after the movie. He became a Drill Instructor. Ruth Hussey was nominated for Best Supporting Actress for The Philadelphia Story. Lol. It’s not chronological, I’ve been watching a few other movies but still mulling over reviews. I’ll get to them sooner or later. I was trciked into buying a couple of these dirt cheap collections but there’s always at least one really great movie among them. I saw that some of the actors are well liked. Compared to pathfinders it’s a real gem, btw. OK – unfortunate comparison. The romance was cringe-worthy because – as so often – it was so quick. “I see you – I get married to you.” Almost within seconds. Maybe a wartime thing. Zero psychology.